Click here to fill your loved one stockings with goodies for Christmas. "Genie Wiley", by Will Johnson, professional genealogist wjhonson@aol.com, at http://www.countyhistorian.com/cecilweb/index.php/Genie_Wiley, copyright 2007-8, all rights reserved. This page is locked, if you'd like to add or correct anything, please email me at wjhonson@aol.com. I am available for hire to assist you to trace your family or create a biography of you or your relative. I charge $25 per hour. "Genie" was a child who was kept virtually a prisoner, almost her entire life, by her parents somewhere in the Los Angeles area. Her parents isolated her, penned her up at night and tied her sometimes during the day, malnourished her stunting her growth, and never spoke to her. She never attended school, only being allowed outside rarely. She never learned to speak. She was found in 1970 age 13, her parents were charged, her father committed suicide. She was studied and helped to learn some language skills, her case was remarkable and exciting, as it could finally answer unanswered questions about language development. After four years the funding and the studies ended. She briefly went back under her mother's care, but then was placed in a series of foster homes, and is still living somewhere in Los Angeles in an assisted living home. Like you, these details repeated over and over, on various websites, were not satisfying to me. I wanted to know more. What were her parent's names? Was her mother convicted? Did her father leave a suicide note? What about her grandparents, what did they know or do? Various postings online claim that her real name has been kept private. I had thought that was because documents were sealed, but as you see shortly, I was wrong. At the time she was found, all the details were reported widely, all across the country. And now I'm going to tell you. Seeing this, I knew immediately something was fishy. Not only were the names known at some time, but more could be discovered, if one were focused and determined. And I am, so I did. Credit:www.homeworking.ws "Genie's" situation was discovered in 1970. Susan's mother Irene had recently left her abusive husband and, taking her daughter Susan with her, was living with her own mother in Monterey Park, California. 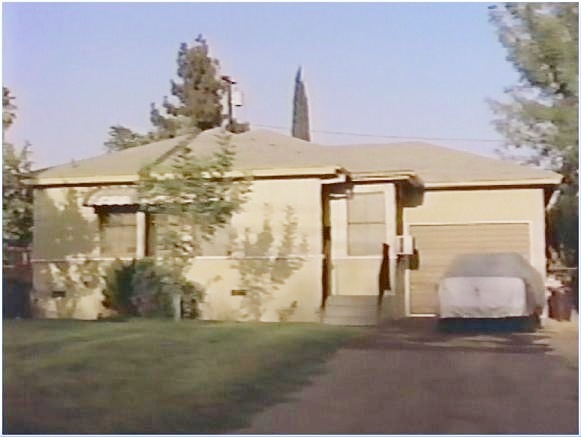 John Wiley, Susan's brother, was living with their father Clark in the family home in Temple City, California. About a month after she left Clark, Irene being nearly blind, went to seek public assistance for the blind, bringing Susan along with her. One version states that an alert social worker spotted the oddly walking and behaving child, alerted her own supervisor who called the police. A second version states that Susan's abnormal background was not discovered until a social services home visit on Nov 4, 1970. Shortly after the real reason for Susan's unnaturalness was discovered, both Clark and Irene were arrested and charged with Felony Child Abuse. A 17 Dec 1970 article "Felony Charge Dismissed in Wiley Child Abuse Case" on page 23C of the Valley News of Van Nuys, California gives her name as "Susan". It repeats her parents names as above and adds that she had a brother or half-brother named John Wiley, calling him "Clark's son". In this same article, Irene is called "of Alhambra, California", although their home is described as being "in Arcadia". In 1970, in the Los Angeles suburb of Arcadia. Susan "Genie" was taken into protective custody. Clark Wiley and Irene Oglesby married in Los Angeles County on 28 Sep 1944. Irene had come to California with her parents Robert Oglesby and his wife Beatrice from her birthplace of Altus, Jackson County, Oklahoma. Clark Wiley did not like children. In fact he disliked them intensely. Clark and Irene had four children altogether, but certainly one of, and probably both of, the first two had died at Clark's hands. Their first child Dorothy Irene Wiley was born 2 Jun 1948 in Los Angeles County. She developed some sort of typical childhood illness, so Clark wrapped her in a blanket and put her in the drawer of a dresser in the garage. She died. Their second child Robert Clark Wiley was born 15 Sep 1949 and died 17 Sep 1949 "choking on his own mucus" as it has been reported. (See here) When their third child John Gray Wiley was born 11 Mar 1952, he initially lived with them apparently, but when John was about four, Clark's mother Pearl, believing that Clark was unbalanced, took John to live with her. 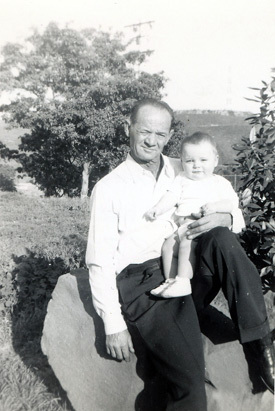 Two years later, on 29 Dec 1958 while Pearl and John were outside together, Pearl was killed by an "out of control pickup truck" and dragged down the street. At this time, John went back to live with his parents. Meanwhile, Clark and Irene had had their fourth and final child Susan M Wiley born 18 Apr 1957 in Los Angeles County. 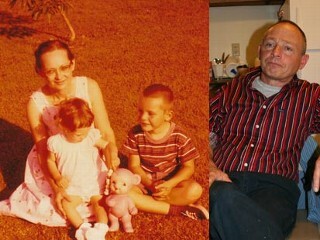 The picture on the far-left shows Dorothy Irene (Oglesby) Wiley with her two surviving children John and Susan "Genie". The side-by-side photo is of that son John Wiley today. The original photo is at the ABCnews article linked below in Sources. The teen-aged driver who killed Pearl was never charged in the incident, which apparently sent Clark even further off the deep end. He blamed his son John for the death of his "beloved mother Pearl"
At this time, the family moved into Clark's deceased mother Pearl's old house on Golden West Avenue in Temple City, California. Although the house had two-bedrooms, Clark did not allow anyone to sleep in his mother's old room, instead the family had makeshift sleeping arrangements in other parts of the house. Clark had been told something along the lines that Susan was perhaps slightly retarded and might develop slowly and developed a strange compulsion that she must be "protected" from the outside world. Clark's idea of protection was to keep Susan shut in her bedroom most or all of every day, and tied into a straitjacket at night. She was also sometimes or often tied to a potty-chair and left that way for hours, all day, or even perhaps overnight at times. Susan still wore diapers, couldn't talk, and was fed a substandard diet which stunted her growth. Her unusual diet consisted of "warm cereal, honey, milk and an occassional egg". (so reports the 18 Nov 1970 Arcadia Tribune) It has been reported that when found she weighed 59 pounds and was the size of a 7 to 8 year old. From years of confinement, her muscles had not developed normally, which caused her to walk in a peculiar way. "Susan is only now learning that there are other people in the world." The family were described as "strange people who kept to themselves." "They never went anywhere, and never took the children anywhere." "They never talked to anybody. Sometimes I saw the child sitting on the porch, I always understood that she was mentally retarded." Both Irene and John have stated at various times that they were terrified of Clark and his bizarre behavior. John has reported that Clark often sat with a gun in his lap. Around October of 1970, Irene estranged herself from her husband and taking Susan, went to live with her own mother, Mrs Beatrice Oglesby, in Monterey Park. (So reports page 6 of the 22 Nov 1970 Arcadia Tribune) She went seeking assistance for the blind but ended up at a Social Services office where an alert worker, seeing this very odd looking and behaving child with Irene, notified her superior who alerted the police. Clark and Irene were arrested in November, 1970 and charged with Felony Child Abuse for keeping Susan virtually a prisoner, almost her entire life. John Wiley, had been allowed to go to school and he appears in the Temple City High School year book for one year, but after the story broke, he declined to have a picture taken. The initial social worker on the case, recommended on 5 Nov 1970, that Susan Wiley "Genie" be removed from her parents and made a dependent ward of the state. Susan Wiley "Genie" had a state appointed attorney and advocate named John Miner. Susan "Genie" lived first at the Children's Hospital, but scientist Jean Butler stating that she had exposed her to German measles, took her to her own home in quarantine. Genie lived there while other investigators like Susan Curtiss, were denied access to her, and Jean applied to be her foster parent. Her application was denied. Susan Curtiss has stated that Jean made-up the idea that she had German measles because she wanted Susan all to herself. Shortly afterward, Susan "Genie" was placed as a foster child with David and Marilyn Rigler, in 1971. David was a psychologist at Children's Hospital, and Marilyn was a graduate student in human development, who would become Genie's first teacher. Meanwhile, Victoria Fromkin (1923-2000), a professor of linguistics at the University of California at Los Angeles, was working on a linguistics program for the child with two associates, Susan Curtiss and Stephen Krashen. Susan Wiley "Genie the Wild Child", lived with the Riglers and their children in their home near Children's Hospital for about four years. Susan's life with the Riglers ended when the National Institutes of Mental Health denied continued payment for the study of Susan "Genie". At this time she went to live with her mother, who having been acquitted of all charges and following cataract surgery, now wanted to take care of her. But Irene found it too difficult and so Genie was moved to the "Beatrice Mansfield family home" in 1975. She was placed with the Crocketts about 1977. Susan's mother Irene Wiley appears in one of these documents dated Jan 1974. And again Irene signs an authorization form in Jun 1975. Susan Wiley was also placed either for training or foster care at Immaculate Heart College 1973, the "Sophia T Salvin School" 1973-1974, "Diane S Leichmann School" 1974-5, and the Lincoln School 1976-7. 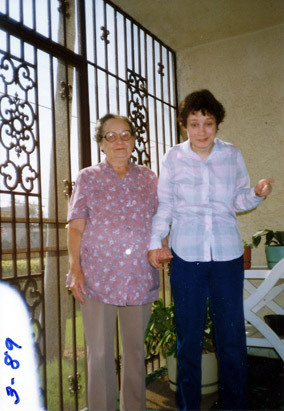 The picture at the left shows Irene Wiley and Susan Wiley "Genie" in 1989. In 1979, Irene Wiley, filed a lawsuit against "Hansen, Rigler, Kent, Curtiss, and Children's Hospital of Los Angeles" charging them with "excessive and outrageous testing....[claiming] the researchers gave testing priority over Genie's welfare, pushing her beyond the limits of her endurance." The mention of the lawsuit appears in an article in the Los Angeles Times, dated 18 Mar 1979 "Retarded Girl Used for Profit, Suit Alleges", by Myrna Oliver. A photograph of the article appears in the BBC documentary on this case here in Part 6. If you stop the tape at time 3:30 you can read that the article states "...Mrs Wiley had cared for the child as best she could..." The lawyers for Irene were Louise Monaco and Samuel Paz. The PBS program "The Wild Child", dated 4 Mar 1997 includes a statement that : "...Genie now lives in an adult foster care home in southern California." Dorothy Irene (Oglesby) Wiley died in 2003 in Los Angeles. Susan is supposed to still be alive in an adult-care home somewhere in California. Her brother John was reported to me, by a site visitor, as having already died, but ABCnews has just interviewed him here. He is now a house painter, living in Ohio. Finding Aid for the Collection of Research Materials related to Linguistic-Psychological Studies of Genie, Section 4 "Guardianship", in particular note : "4B. Education . 1970-1977 Subseries is comprised of school progress reports, pedagogical material from the Los Angeles Unified School District, a small amount of correspondence, and other ephemera and miscellaneous material. [ Box 54 ] [ Folder 5 ] Authorization for exchange of medical, psychological, and education information between school and David Rigler . 1975 June 2 Signed by Irene Wiley." Finding Aid for the Collection of Research Materials related to Linguistic-Psychological Studies of Genie, Section 8C "Family History", Box 62, Folder 34 Original notes and interview material of Irene Wiley. 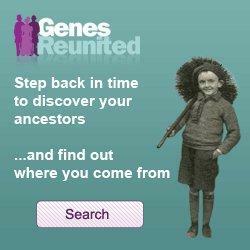 1970 November 23-1974 December 30 Includes photocopies of family genealogical register. The Daily Report (Ontario, California)], 17 Nov 1970, page A-2, "Parents Charged in Girl's Imprisonment" : [with a picture of Susan] "Susan Wiley, a teenager with the mentality of a 12 to 18 month old infant, was kept a prisoner in the home of her elderly parents for 13 years. No reason was given for her confinement...." "...The girl's plight was discovered by a social worker who visited the home...the family applied for welfare aid and an eligibility worker was sent to their home.... A son John, 18, was sent to live with his grandparents following the arrest of his parents." Valley News (Van Nuys, CA), Dec 17, 1970, page 23C "Felony Charge Dismissed in Wiley Child Abuse Case"
California Birth Index 1905-1995 showing "Susan M Wiley born 18 Apr 1957 Los Angeles County, California. Mother's maiden name: Oglesby". Searching on *any* child born to father Wiley and mother Oglesby we get the whole family: "Dorothy Irene Wiley born 2 Jun 1948, Robert Clark Wiley born 15 Sep 1949, John Gray Wiley born 11 Mar 1952, and Susan [as above]. All born in Los Angeles County." California Death Index 1940-1997 showing "Dorothy Irene Wiley born Jun 2, 1948 California, died Aug 19, 1948 Los Angeles County, California. Mother's maiden name Oglesby" and "Robert Clark Wiley born Sep 15, 1949 California, died Sep 17, 1949 Los Angeles County, California. Mother's maiden name Oglesby"
Genie: A Psycholinguistic Study of a Modern-Day "Wild Child" (Perspectives in neurolinguistics and psycholinguistics), by Susan Curtiss. 304 pp. "Raised by a Tyrant, Suffering a Sibling's Abuse: John Wiley's Life May Foretell the Brutal, Lonely Future for Austrian Family", ABCnews, 19 May 2008, Susan Donaldson James. Thanks to site reader Jan H. Jørgensen for alerting me to this news story. Stephen Krashen is professor emeritus at the University of Southern California. Clark Wiley married Dorothy Irene Oglesby in Los Angeles County on 28 Sep 1944 where her parents were living at that time. Clark and Irene had four children, all born in Los Angeles County, California but two died young, probably at his hands. The eldest child has been reported to have died due to Clark's neglect and the second child's death, only two days old, "choking on his own mucus" seems suspicious. Clark's middle name could possibly be "Gray" as his second son carries that middle name. This son John is yet living, in Ohio. When John was age four he was taken to live with his grandmother "Mrs Pearl Martin", Clark's mother. He lived with her about two years, up to the time, when he saw he get struck by an out-of-control pickup truck when he was six. John then went back to live with his parents. His father Clark blamed John for the death of "Clark's beloved mother" (John's grandmother). Clark Wiley, a retired machinist, has been described as some sort of recluse — "They never went anywhere and never took the children anywhere. They never spoke to anybody." Clark was the main power in the home, his wife Dorothy being nearly blind was totally dependent on and frightened of him. Their son John has stated that Clark often sat with a gun in his lap. Clark and Dorothy were the parents of Susan Wiley called "Genie" in some of the popular books and scientific papers about her case. Clark and Dorothy were arrested once the authorities found that Susan had been kept virtually isolated from normal human contact almost her entire life of thirteen years. Susan still wore diapers, couldn't talk, and was fed a substandard diet which stunted her growth. It has been reported that when found she weighed 59 pounds and was the size of a 7 to 8 year old. From years of confinement, her muscles had not developed normally, which caused her to walk in a peculiar way. The family were described as "strange people who kept to themselves." Just moments before his scheduled arraignment, with his wife Dorothy, on Felony Child Abuse charges, Clark Wiley shot himself in the head on 20 Nov 1970, using a 38-revolver. His body was found in their home, by their son John aged 18, who was waiting outside to drive Clark to the courthouse. (Arcadia Tribune, 22 Nov 1970) Clark's death was handled as a suicide, since he was alone in the house, while his son and other boys were waiting outside to drive him to court. "John Wiley had been staying with a friend Bruce Moore for the past two months." The revolver and a brief note stating "John will understand" he had left, were both found nearby. Another note told his son John what shirt he wanted to wear for his funeral. Irene had entered a plea of "not guilty" just prior to being told, at the arraignment, that Clark was dead. Irene went to trial in Municipal Court, but the judge dismissed the charges against her. Bruce Moore said "up to a thousand cars have been driving by here, and between 100 and 150 of them have stopped in front of the house." Moore laid the blame for the elder Wiley's suicide on the press. He also said of Susan, "I've seen her outside. She wasn't kept a prisoner. The girl had been retarded since birth... And she had toys, I've seen her playing with them." Dorothy Irene Oglesby was born probably about 1920. She is described as "age 50" in newspaper accounts dated Nov 1970. She married Clark G Wiley and they had four children, two of whom survived childhood. The condition of her daughter Genie was discovered when Irene left her abusive husband and went to stay with her own mother, while seeking public assistance. The child was initially made a ward of the state. Much later Irene regained custody but finding Genie too much to handle, she was placed with a series of foster homes. Dorothy was still living in 1993/5 when there are some letters from her in the "Finding Aid" file above. An Oglesby relative informs me that "My Aunt Irene died in 2003 in Los Angeles". "Any Connections to Oglesby line", posting by Donna Oglesby 16 July 2007 to the Oglesby forum at genforum.genealogy.com stating that Dorothy parent's were : "Robert Franklin Oglesby ... and his wife Beatrice Palmer. Robert died July 1982 in Ontario California and buried in Ontario Cemetery, California. Beatrice died 24 February 1985 and is buried next to her husband, in Ontario California." "Irene Oglesby", pedigree view, "Underwood" by Bill Underwood, 22 Apr 2008, hosted in the Rootsweb WorldConnect Project showing her mother as "Beatrice Palmer" and Beatrice' parents as "Thomas Jefferson Palmer and Teresa M Thomas"
"Wild Child Speechless After Tortured Life", ABCnews, 7 May 2008, Susan Donaldson James. "Raised by a Tyrant, Suffering a Sibling's Abuse", ABCnews, 19 May 2008, Susan Donaldson James. Thanks to site reader Jan H. Jørgensen for alerting me to this news story. 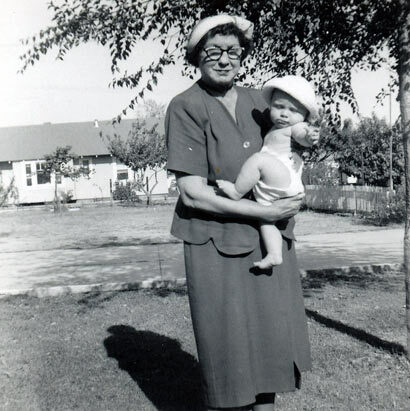 Pearl May Cook was born 13 May 1881 in Oregon, probably in Lane County, the daughter of Isaac Cook and his wife Minerva Tuttle, who had probably moved there from Missouri. I was unable to find Pearl's death in the California Death Index at Ancestry, but site reader Tricia Putnam has informed me, that it exists in the Death Index hosted at vitalsearch. I can't explain why there should be a difference. At any rate, the entry now found, identifies her as the daughter of a Cook father and a Tuttle mother. The picture at the right is Pearl Martin with her grandson John. Original photo at ABCnews. She is named as "Pearl Martin, John's paternal grandmother" here. She was born in 1881 ("age 77" at her death), place unknown. She married Juda Wiley, and later a Mr Martin. She is reported to have "run a bordello" (see here). She took John Wiley when he was 4 to raise him herself because she thought her son Clark was unstable. John only lived with his grandmother about two years, since she was killed 29 Dec 1958, in a hit-and-run accident by an "out-of-control pickup trunk", "while crossing a street near her home" which "slammed into [her] and dragged her mangled body down the street" in California when "John Wiley was 6 years old". (see ABCnews "Raised by a Tyrant...", Pasadena Independent 30 Dec 1958). Pearl is very hard to find in the California Death Index at Ancestry.com. There is no Pearl May Martin who died in 1958, there is no Pearl Martin who died on 29 Dec 1958. So she must be hiding out under a different name. Site reader Tricia Putnam informs me that at vitalsearch they do have this Pearl in the Death Index, so I don't know why Ancestry wouldn't. At any rate the data given there, per Tricia is : "Pearl May Martin, 13 May 1881 Oregon, 29 Dec 1958, Los Angeles County, California; father Cook, mother Tuttle"
Star-News, 30 Dec 1958, "Woman, 77, Fatally Injured When Hit by Car in Arcadia"
Pasadena Independent, 30 Dec 1958, "Auto Strikes, Kills Arcadia Woman, 77"
The photo at left is Robert Franklin Oglesby and his grandson John Wiley. Originally found at ABCnews. Robert Franklin Oglesby was born 29 Dec 1898 in Lamar County, Texas, the son of William H Oglesby and his wife Fannie. His father is likely that W H Oglesby for whom he says he works on his World War I Draft Registration Card. W H appears in the 1920 census for Jackson County, Oklahoma, aged 48 born in TN. Robert and/or his parents moved to Oklahoma by 1910 when they are found in Mangum, Greer County, Oklahoma. Robert is next found on the World War I Draft Registration Cards working as a farmer for "W H Oglesby". He married in 1920, probably in Oklahoma, to Beatrice Palmer, an Oklahoma native. She is living with her parents in 1920, but in 1930 Robert and Beatrice already have a 9-year-old daughter. So they must have married in 1920. The family is living in Altus, Jackson County, Oklahoma in the 1930 census. They had at least three children: Irene, Doyle and Wanda Sue. Between 1930 and 1938 he made his last major move, taking his family to Los Angeles County, California. Robert died 2 Jul 1982 in Los Angeles County, California. 1900 Census of Roxton, Lamar County, Texas : "W H Oglesby, 29, GA; Fannie 26 MO; Hattie 5; Stanley 2; Robt 1"
1910 Census of Mangum, Greer County, Oklahoma : "William H Oglesby 38 GA; Fannie 39 MS; Hattie 14 TX; Stanley 12 TX; Robert 11 TX; Hurcle 9 TX; Loyd 2 TX; Royce 2 TX; Elvis 1 4/12 OK"
1930 Altus, Jackson County, Oklahoma: "Franklin R Oglesby 32 OK/TX/TX, Superintendent, Oil Mill; Beatris 27, Irene 9, Doile 7"
1938 : "Mrs Beatrice Oglesby, 3971 Snow dr, housewife, did not state [party affiliation]; Robert F Oglesby, 3971 Snow dr, service station, Democrat"
1942 : "Mrs Beatrice Oglesby, 1035 N Hazard Av, housewife, Democrat; Robert F Oglesby, 1035 N Hazard av, drill operator, Democrat"
California Death Index : "Robert Franklin Oglesby, born 29 Dec 1898 Tennessee, Died 2 Jul 1982 Los Angeles [County]"
Beatrice Palmer was born 2 Nov 1902 in Oklahoma, the daughter of Thomas J Palmer and his wife Theresa. Beatrice married Robert Franklin Oglesby about 1920, probably at Altus, Jackson County, Oklahoma where they were both living at the time. They had four children, at least the first two in Oklahoma. By 1938 the family had moved to Los Angeles County where they lived until at least 1956. When Susan was found Nov/Dec of 1970, "Mrs Beatrice Oglesby" was living in Monterey Park, California. Beatrice died 24 February 1985 and is buried next to her husband, in Ontario, San Bernardino County, California. 1910 Census of Altus, Jackson County, Oklahoma : "Thomas J Palmer, 44, AR/GA/MS; Theresa 35 AR/AR/AR; Virgie L 13; Elmore T 9; Beatrice 7; Harrison S 6; Hurston H 3; Not Named 1/12"
1920 Census of Altus, Jackson County, Oklahoma : "T J Palmer, 60, Kansas; Thanasi 40 AR; Beatrice 17 OK; Ceymore 15 OK; Hastin 12 OK"
1930 Altus, Jackson County, Oklahoma: "Franklin R Oglesby 32, Beatris 27, Irene 9, Doile 7"
Social Security Death Index : "Beatrice Oglesby, born 2 Nov 1902, died Feb 1985, last residence Ontario, San Bernardino County, California"
This page was last modified on 1 March 2011, at 22:45. This page has been accessed 759,087 times.